Colisa fasciata common name indian banded or pygmy gouramie. They can grow up to 10-13 cm / 5 inches fully grown. 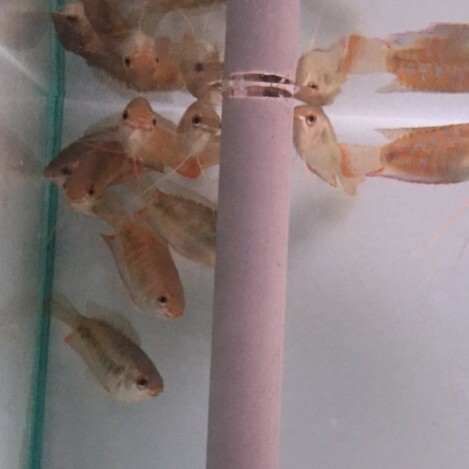 They are best kept in water parameters of PH range of 6.5-7.5, and temperatures of 21-28 Celsius / 70-82 ° F.
The Indian gouramie are lovely, and peaceful fish. 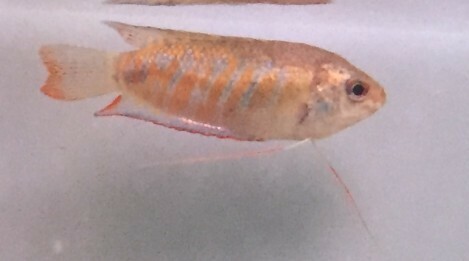 They are an extremely shy fish. They mix better with small community fish. How timid they it is best to mix them in pairs, or groups. They eat most foods like flake, pellets, and granular foods. But as they are so shy you do have to make sure they eat the food. They do enjoy plants and algae based foods in there diet to. Also as a treat freeze dried, frozen or live foods. They will eat most foods like flake, pellets, and granular foods. Also live and frozen food is good for treats.